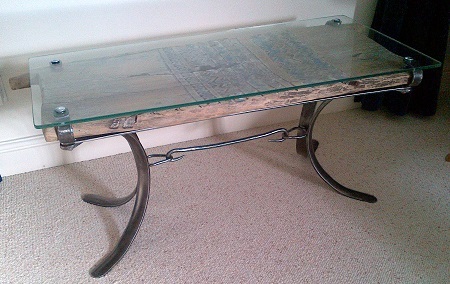 This is a table I forged with glass top over a tribal hut door from Namibia. 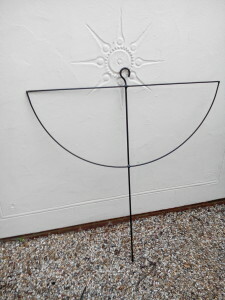 I made this gate for both security, and to fit with the organic design of the cottage garden. 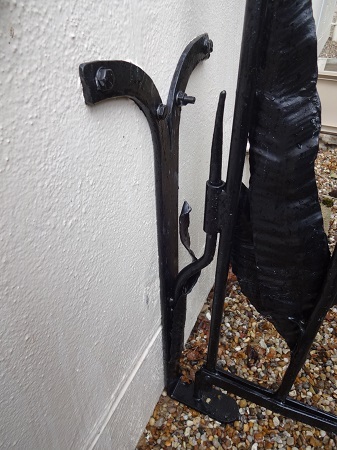 The stems reach up above the gate to provide that extra bit of security. The gate is quite heavy; I prefer to blacksmith with heavier metal, rather than that of flimsy shop-bought metalwork. It gives the designs strength, both literally and artistically. 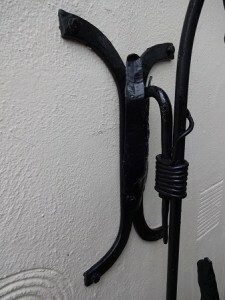 The weight of the gate means that it is not suitable to purely hang from the wall, so it also sits on a baseplate which takes the weight, and makes the gate swing smoothly. 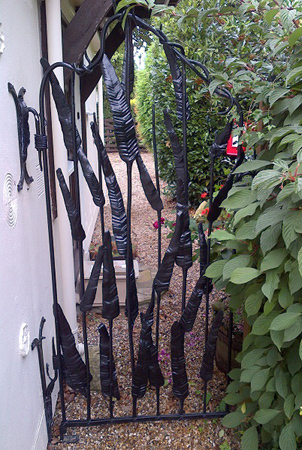 The gate is galvanised and painted in silk black to preserve the detail in the leaves. 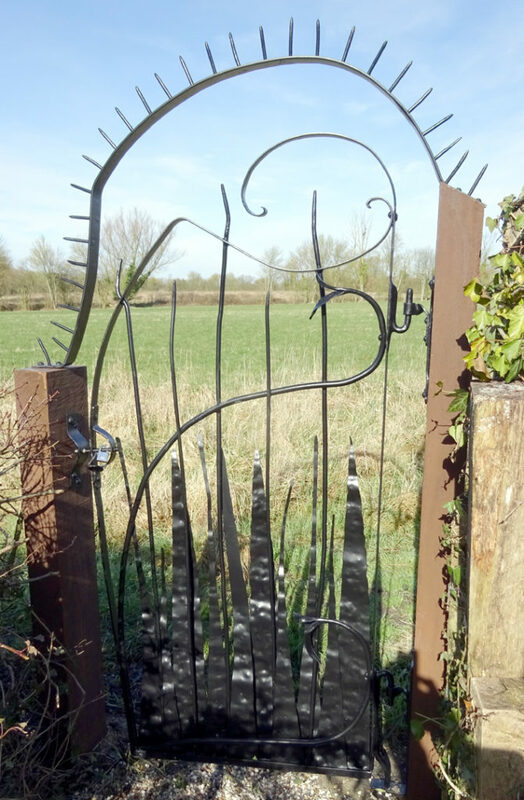 This is a gate I made to give us access to the field side of our long hedge for cutting etc. 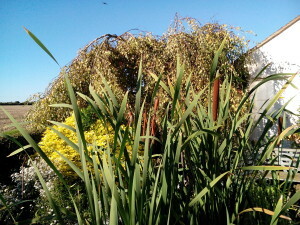 In this picture you can see bullrushes in a garden pond. In the background you might be able to see a sculpture I made to reflect these bullrushes. if you can’t make it out then this is what it looks like close up. 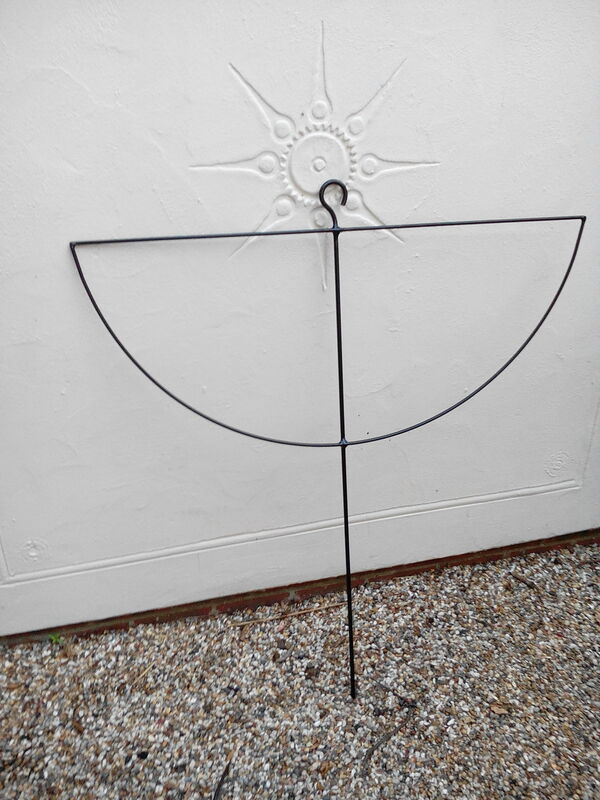 it is rusting nicely and is designed so that the wind blows the leaves against the rushes and gives a nice wind chime effect. 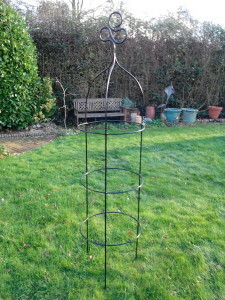 This o belisk is 2m high and 0.5m diameter. 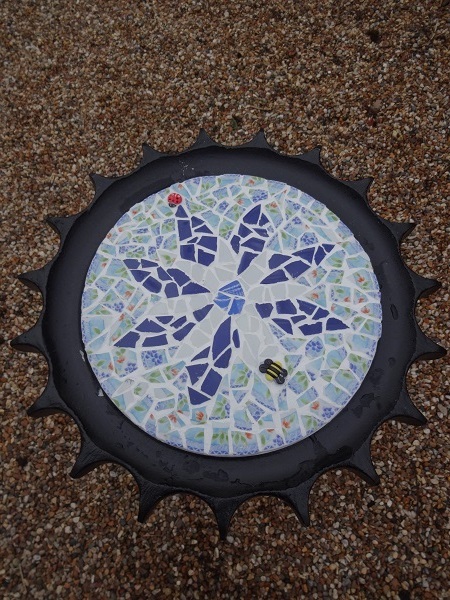 Its design was based on obelisks I have made for our garden, and the top of a sculpture I made to resemble flowers, with stained glass inserts. This version doesn’t have the glass ‘petals’ (yet), but I am hoping that they might be asked for and added later. Not all of my blacksmith forge projects are big complicated ones. I also enjoy bringing simpler ideas to life. For this project I made a simple but elegant support frame for a grape vine. 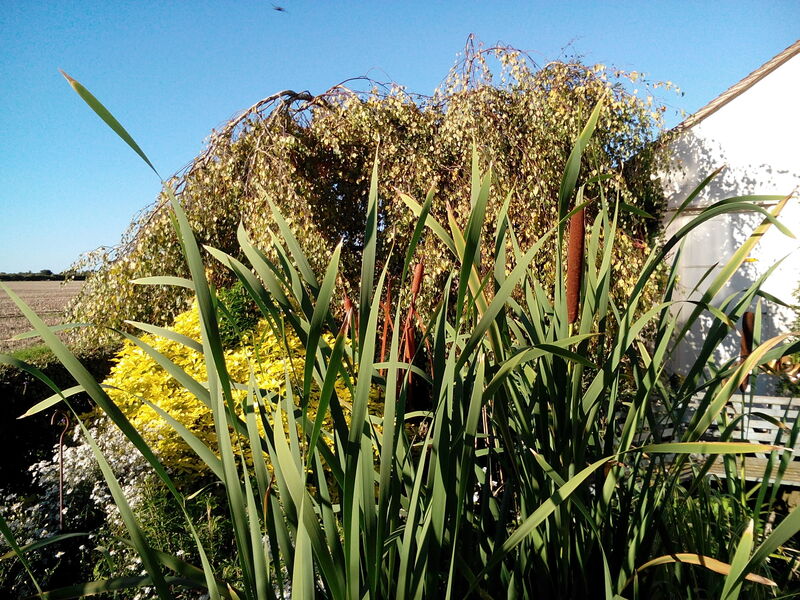 It needed to be strong, and capable of taking the all year weight of the vine. 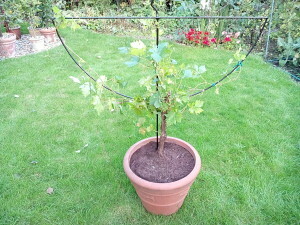 It also provides the shape around which the vine was trained and pruned. This picture shows the support, which I painted in zinc rich primer and matt black to give it some extra weather protection. This forged table was inspired by me seeing a tractor gear wheel and thinking that, with an organic forged stand, it would make a great table top. 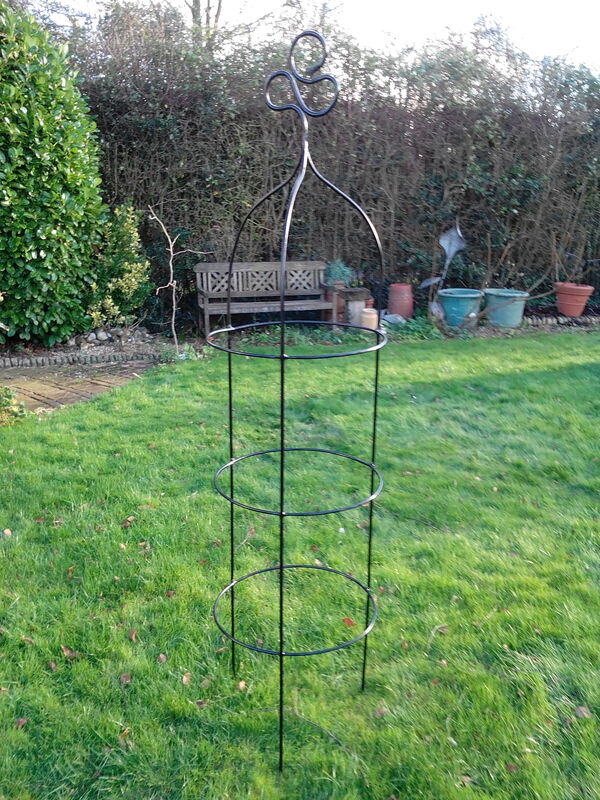 An idea from my wife to add a mosaic top and hey presto. 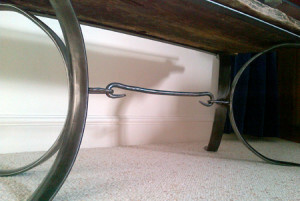 This table was galvanised for durability before being sprayed silk black. 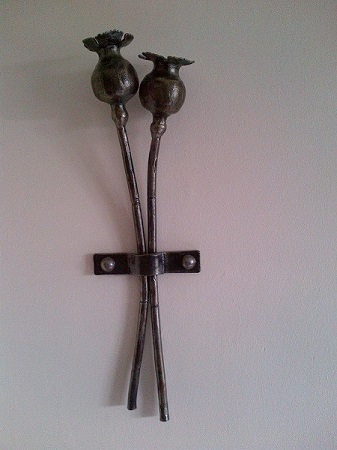 This is to show that not everything I forge has to be on a large scale (this is 40cm tall). 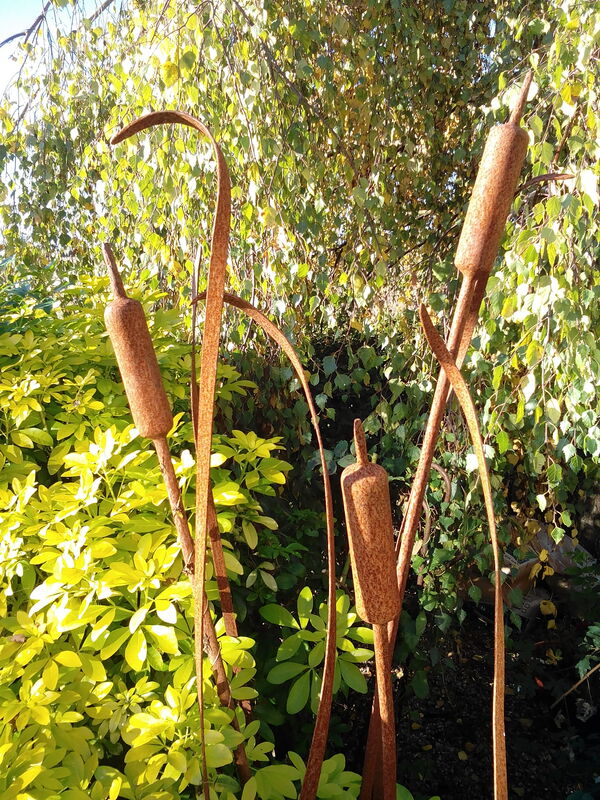 This one was inspired by Steve, the blacksmith who taught me a great deal about organic flow in metalwork, and who had a ‘special’ homemade tool used to help make the seed pod shape out of steel tube. He sadly died in his mid 50s; cheers Steve. 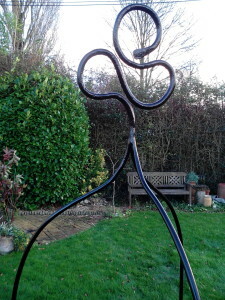 email to: blacksmith@andybennettuk.co.uk to enquire about blacksmithing commissions. 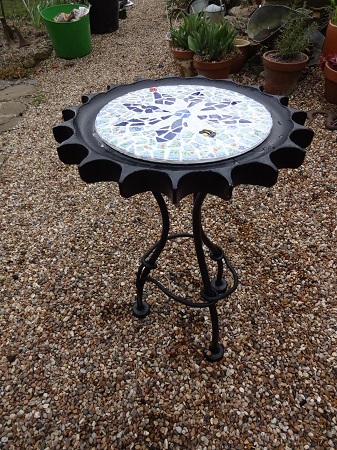 I can design almost anything from your ideas, or can forge from your own designs or photographs. I also offer experience days.